The Cork Oak is an evergreen species, which can grow up to 26 metres tall, and commonly live more than 200 years. Cork is one of the world's most important renewable forest products. 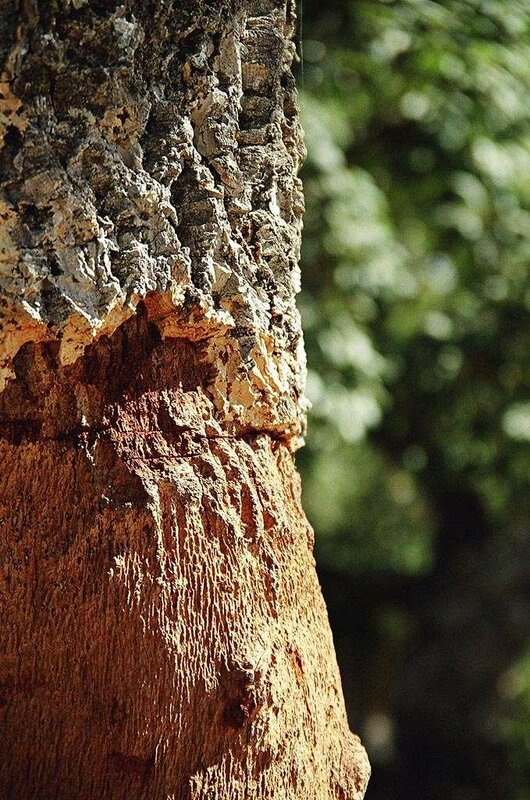 The cork bark is stripped off the tree in a thick cylindrical layer. Each tree is harvested every nine years. Cork oaks are commonly found in South-western Europe (France, Corsica, Italy, Sardinia, Sicily, Portugal, Spain) and northern Africa (Algeria, Morocco, Tunisia). The cork oak favours acidic soils, requires a hot dry summer season and a cold and moist winter. Its bark is beige, deeply fissured and corky/spongy to the touch, which can be as thick as 15cm in places. Its leave, 4cm in length, are weakly lobed with a slight point at the tip. The lower third of the tree has often had the bark removed, revealing a dark red/orange trunk. Planting Cork oak will support an abundance and variety of rare and endangered wildlife. In Western Europe, particularly in Portugal and Spain, the cork oak forests are home to endangered species such as the Iberian lynx (the most critically threatened feline in the world), the black vulture, booted eagle, Bonelli’s eagle and short-toed eagle, which make giant nests in cork trees. Its thick, insulating bark makes the Cork oak well adapted to forest fires. In Portugal where summer wildfires are a genuine threat, Cork oaks have made up a significant percentage of our reforesting efforts. It is one of the few trees that are able to regenerate their bark. Cork oaks have been grown since the Middle Ages in Portugal and Spain in open woodlands grazed by sheep and cattle. High-value ham is obtained from the Iberian pigs that thrive on the fallen acorns. The European cork industry produces 300,000 tonnes of cork a year, with a value of €1.5 billion and employing 30,000 people. A single tree can cork 4,000 bottles! In addition to being used in the wine industry, cork can be used to make floats, engine gaskets clothing, heels and handbags! It is also used in making cricket balls, badminton shuttlecocks, handles of fishing rods and even surfboards. A giant Cork oak in Portugal has recently been nominated as European Tree of the Year. The 14-metre high cork tree is located in Águas de Moura, in Palmela, Setúbal, and is a whopping 234 years old.